The theme for this month's TBR Challenge is "all about the hype." The Snow Child by Eowyn Ivey is a best seller, and in certain reading circles this book definitely qualifies under that theme. It has been in my own "to be read pile" since March. Does it live up to the hype? Let's see. Alaska, 1920: a brutal place to homestead, and especially tough for recent arrivals Jack and Mabel. Childless, they are drifting apart—he breaking under the weight of the work of the farm; she crumbling from loneliness and despair. In a moment of levity during the season’s first snowfall, they build a child out of snow. The next morning the snow child is gone—but they glimpse a young, blond-haired girl running through the trees. Definition (Wiki): Magic realism or magical realism is an aesthetic style or genre of fiction in which magical elements blend with the real world. The story explains these magical elements as real occurrences, presented in a straightforward manner that places the "real" and the "fantastic" in the same stream of thought. 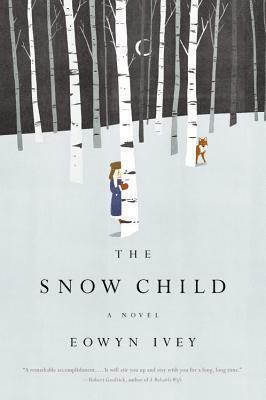 The Snow Child is a realistic portrayal of the rough and often violent life as it was in Alaska in the 1920's, combined with a magical fairy tale. I wanted to know what the hoopla was all about, and found that what makes this book so special, besides the beautiful prose, lies in how well Ivey brings the magic of a fairy tale into the realm of the possible and the beauty and harsh realities of 1920's Alaskan rural life become magical until together they become a possible magical reality to the reader. Magical realism? Absolutely. "Wife, let us go into the yard behind and make a little snow girl; and perhaps she will come alive, and be a little daughter to us." Jack and Mabel moved to Alaska to start over almost ten years after Mabel lost her baby during childbirth. Jack is breaking under the brutality of working an Alaskan farm alone and thinks himself too old to start over. Mabel is dying of loneliness and depression to the point of becoming suicidal, but having drifted apart she doesn't tell Jack, and of course Jack doesn't share his concerns with Mabel. It is after a fun, light visit to neighbors George, Esther and their sons that during the first snowfall Mabel and Jack playfully build a little girl out of snow in their front yard and spend an evening together. Next day, for the first time both see a little girl running through the woods wearing the mittens and scarf previously worn by their snow girl. A game of hide and seek ensues, but the little girl, who always seems to be accompanied by a red fox, is so quick that neither Jack nor Mabel can catch her. Eventually, the child decides to become a part of Jack and Mabel's life, on her own terms. She comes and she goes, the woods always a part of their life... until summer arrives, when the child disappears and everything seems to go wrong. There are desperate, dark moments as Jack and Mabel work and almost give up on the farm and each other. Thankfully, George, Esther and their son Garrett are there to help whether they want it or not! But when winter returns, will the child return with it? Through this first part of the novel, Ivey sets the atmosphere for the story by using the beauty and danger that nature in a barely explored Alaska presents. Ivey incorporates nature into the story by making the snow girl part of it, and through her both Jack and Mabel come to appreciate and respect its bounty, beauty and danger. Through Jack's experiences with the child, Ivey brings to the reader moments that are both wondrous and hard to explain combined with a stark reality to the little girl's seemingly magical existence, firmly placing this novel into the realm of magical realism. The second part of the book is one of the most heart wrenching of the story, yet one of the best! Mabel and Jack finally confront much of their past. I love the way the balance teeters and shifts between the main characters -- Mabel, Jack, and Faina. Secondary characters also gain depth in this section. Esther!! I love her down-to-earth, loud and take-over personality. The contrast between Esther and Mabel is sharp -- where Mabel's flights of fancy take the reader into the world of fairy tales and magic, Esther serves to ground the reader to reality. At this point, her youngest son Garrett is groomed as an important character as he plays the role of teacher to Jack and Mabel and soaks up the respect and singular attention focused on him by these two lonely people. Ivey uses a Russian fairy tale as the base for her story, and as in all fairy tales there is magic and in this one love, but also as in all fairy tales there is a dark side. I think it is best said by Ada, Mabel's sister, in one of her lovely letters, " Why these stories for children always have to turn out so dreadfully is beyond me. I think if I ever tell it to my grandchildren, I will change the ending and have everyone live happily ever after. We are allowed to do that, are we not Mabel? To invent our own endings and choose joy over sorrow?" The sorrow is expected, yes? Ohhh, but there is also joy and happiness in this story! The Snow Child is Eowyn Ivey's debut novel, and an excellent debut it is! It is a tale of contrasts where the renewal of the human spirit is brought about by nature's glorious beauty and stark brutality, by believing in love given and accepted freely with all those harsh realities that just make the magic so much more powerful. I recommend it to lovers of fairy tales, nature, magical realism, fans of Alice Hoffman, and to those who just love a gorgeous story with beautiful prose and unforgettable characters. NOTE: This was a wonderful book to read right before the Thanksgiving holiday! It sounds good though perhaps a bit darker than what I usually like to read at this time of the year. Alex, I actually didn't pick this book up thinking it was great for this time of the year... but by the end thought it perfect. :D Interesting, right? Yes, I loved this book and recommend it. This sounds fascinating. Like Alex, I'm thinking it's a bit darker than I'd normally go for. But I'm going to try and keep an open mind for one day down the line when real life isn't so stressful. Phyl, I think you might enjoy this book. I hope you do. As I said to Alex, I didn't know what to expect and didn't think about it being pertinent to this time of the year. But by the end? Yes... I thought this read was definitely pertient as a Thanksgiving read... you know, going through the trials life presents, and then at the end of the day realizing there is so much to be thankful for. It's a beautiful story! That helps to hear. My library has a bunch of copies. I will go pick one up next time I'm over there. What!? You read this one, too!? It's been on my list since it first came out. SO glad to see you loved it. Wendy, yes... it seems to have been well received in some circles (it is a best seller), and not so well received by others. I would say it is definitely a read that would be best recommended for lovers of "fiction" or "literary fiction," not one I would recommend for those who read strictly romance. Oh, I've been wanting to read this one since it was released, and of course your beautiful words have me even more intent on doing so. I love wintry books, and rural living--part of me wonders if I'd appreciate the mothering aspects of this book more if I were a mother myself. Still, I likely won't wait THAT long to read it. Irene, this is a gorgeous book. A mixture fairy tale and historical fiction -- magical realism. The prose is just beautiful. If you like wintry books, you'll enjoy the Alaskan landscape as it is described here. I've been wanting to read this since AMy recommended it, too! It sounds gorgeous. Arnel, definitely give this book a try! I personally think it is worth a read.